In January 2016, I started a social documentary project to photograph the City of London. This projects is ongoing and evolving over time. When I started I thought it would take me about a year to make a set of images and I would move onto something else. Part way into the project England voted for Brexit and I realised that I needed to keep going with this project. It has become apparent to me that the project has developed a life of its own and I will stop it the day that Brexit happens or Brexit is cancelled one or the other. In making the images for this project I have really developed my street photography techniques and am finding that as I work on this project my skills have improved. I am able to anticipate thinks more and make more complex images, juggling multiple elements in my images. As I have worked on this project my ambitions for it has grown. It is fun being a Street photographer in London, as there is alway something to observe and photograph. The City, is changing before us yet most of us don’t realise just how much the City of London has already changed, even in the time since I started on this project. I had the realisation the other day, as I was walking near the Lloyd’s building, that London is getting a downtown area, one of skyscrapers. Some of these new massive buildings block the light and create mini weather systems. Some streets, have become wind tunnels and others, have these wonderful warm patches caused by air vents, that could make winter days on the street quite pleasant. I find often that their are patches where light is being reflected off a building onto the street, these vary by times of day, duration and intensity. 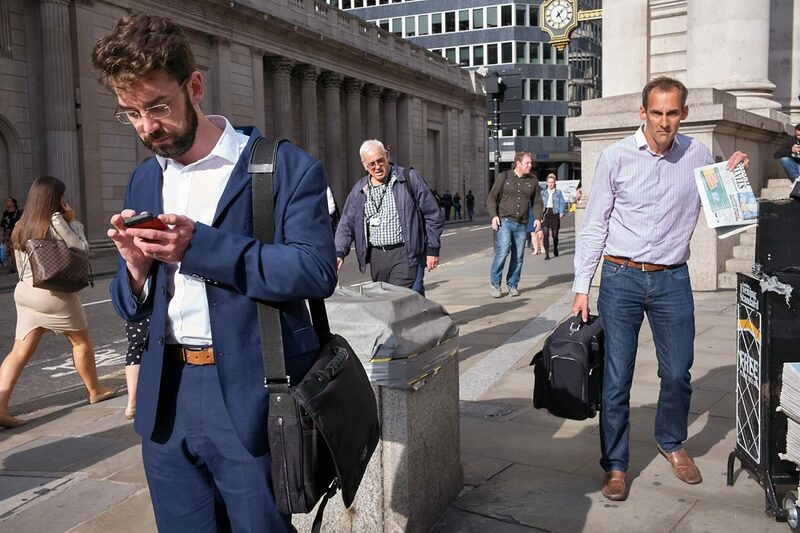 The process of documenting a City like London has taught me a lot about how people use the City and my own practice as a street photographer, London is a vibrant city and this reflects in the density and diversity of people at various times of the day. I find that there are three busy times of the day in the City that are productive for street photography, these are the evening and morning rush hours and at lunchtime as the density and likely hood of something interesting happening increases.